LOS ANGELES (AP) The Los Angeles Dodgers are once again loaded in their chase for an elusive World Series title. A rock-solid starting rotation. Hitters who can produce offensively and defend multiple positions. Overall depth that allows for aggressive platooning. 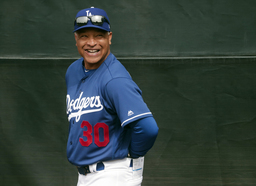 Manager Dave Roberts received a contract extension through 2022 during the winter. He's guided the team to 287 victories in his first three years at the helm, tied for fourth-most among mangers during that span. The team has averaged 94 wins a season during its run of six straight NL West championships. "We have created something here where the number one goal is to win baseball games," Roberts said. "It takes a lot of good players. It takes consistent work and focus, but it also takes sacrifice. So that comes with a lot of good players and, fortunately, for us to a man, these guys have bought into that, which makes my job considerably easier." All that success, however, hasn't led to a World Series title. The franchise's last one came in 1988. Two straight appearances in the Fall Classic have ended with Houston and then Boston celebrating on the Dodgers' field. History suggests a World Series hangover is inevitable. The Dodgers won an MLB-best 104 games in 2017 and they fell short in repeating that total last year with 92 victories. The franchise has never made three straight World Series appearances. NEW FACES: CF A.J. Pollock signed a $55 million, four-year deal to leave division rival Arizona. He gives the Dodgers a right-handed bat to complement their deep lineup. He missed nearly two months with a broken left thumb last season, the latest in a long line of injuries that have limited Pollock to 113 games since his breakout All-Star season in 2015. RH reliever Joe Kelly comes over from the Red Sox after they beat the Dodgers in the World Series. He'll be Kenley Jansen's setup man. ROOKIES TO WATCH: OF Alex Verdugo could find a spot on the opening day roster after a glut of outfielders has kept him in the minors in recent years. He could platoon with Cody Bellinger in right field and be a third option in left field. RHP Dustin May is expected to start the season in the minors but could contribute to the big-league club at some point. RHP Tony Gonsolin has an outside shot at catching on in a relief role. TOP-NOTCH ROTATION: The Dodgers boast quality and depth in their pitching ranks, which will allow them to withstand any injuries that occur. LH Clayton Kershaw won't start opening day for the first time in nine years because of left shoulder inflammation that bothered him during camp. Kershaw's velocity dipped to an average of 90.9 mph last season and his strikeout rate of 8.7 per nine innings was his lowest since his rookie year. Despite back problems in recent years, he remains one of the best pitchers in the National League. RH Walker Buehler, coming off a stellar rookie year, has had a sore shoulder that limited him in camp. RH Kenta Maeda started 20 games last year, but finished the season as a reliever and worked out of the bullpen during the postseason. However, the Dodgers see him as a starter and plan to use him in that role to begin the season. LH Hyun-Jin Ryu and LH Rich Mill make up a solid backend of the rotation. PROVE IT: SS Corey Seager returns as the starter after missing most of last season when he underwent hip and Tommy John surgeries. The 2016 NL Rookie of the Year will have to prove himself all over again. The team took a conservative approach with him during camp, but Seager showed he could make all the necessary throws his position requires. The Dodgers compensated for his loss last year by trading for Manny Machado, who moved on to division rival San Diego in the offseason. AWAY FROM TEAM: OF Andrew Toles, coming back from injury, never reported to spring training because of an undisclosed personal matter. ON DECK: The Dodgers open the season on March 28 at home with a four-game series against the Arizona Diamondbacks. The rival San Francisco Giants follow them to town for a three-game set. Matt Kemp and Yasiel Puig, who were traded during the winter, return to Chavez Ravine with the Cincinnati Reds in mid-April. The New York Yankees make a rare L.A. appearance in late August. AP freelancer Theresa Smith in Glendale, Arizona, contributed.